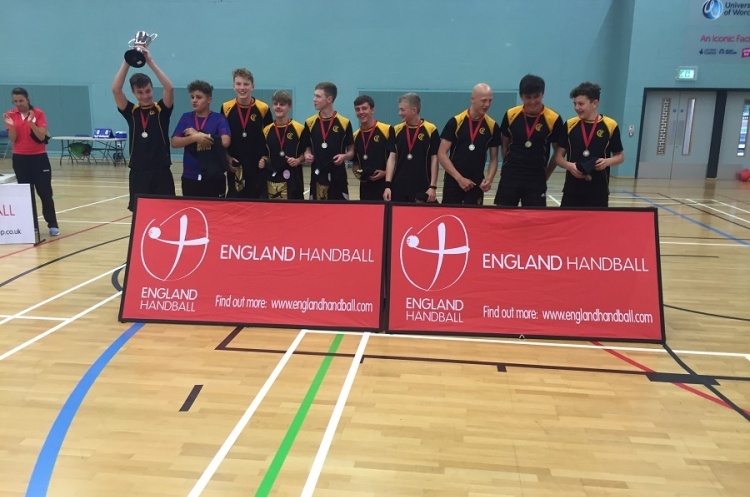 Crispin School boys’ Year 11 handball team, who won the England Handball Schools Under-15 title last year, made their mark at the prestigious Caban Cup in Poland. Before their first match the team had the chance to watch some of their opponents in action. The standard of handball was something to behold, and the step-up in style and technical ability on show was clear from the outset. It was, therefore with an element of nervousness, the team went into their first match against Olimp Grodkow. In a pulsating game Crispin found themselves 4-1 down within the first five minutes. However, they fought back brilliantly to trade goals all the way to 11-11, before eventually succumbing to a heart-breaking 13-12 defeat. Their second match was against hosts and tournament favourites Pmos Chrzanow. Despite giving away years of experience to their opponents Crispin made the game very competitive. It was only really in the latter stages that Chrzanow managed to pull away to record an 18-11 victory. By this stage the boys had come to realise that, whilst their task was a daunting one, they had the ability and tenacity to be competitive. This was shown when Crispin produced what many considered the result of the weekend by beating UKS Jedynka Myslenice 9-8 in a truly epic encounter. Every member of the team played their part and goals from Joe Nelson, Kyle Strange, Matt Davey, Corey Baker - and some epic goalkeeping by Jay Blackwood - confirmed to the other teams that Crispin were definitely not to be taken lightly. Saturday’s final round-robin match was another competitive performance against Zew Swiebodzin, who ended the tournament in fourth place. Despite another defeat Crispin had enough goals (goals-scored, rather than goal difference being the deciding criteria in the event of a tie) to guarantee a third-place finish in their round robin group. This was beyond their wildest dreams at the outset and meant that they were guaranteed to finish no lower than ninth in the overall tournament standings. The final two matches of the weekend were against the two teams who had also finished third in their groups. The first saw Crispin lose to a very strong KS Vive Kielce, whilst a final win eluded them in their last match against PM Tarnow. The blow was softened by the fact that, by now, Crispin had been adopted by the supporters of all the other teams as their second favourites. Every time Crispin scored the entire crowd erupted with a crescendo of drums, horns and hooters. The icing on the cake was when several of the organisers made a point of naming Kyle Strange’s deft lob as ‘goal of the weekend’. It was also noteworthy that almost all the opponents found it necessary to man-mark Crispins’ Joe Nelson. Also the team stayed determined despite playing under the influence of heavy colds by the end of the weekend. The tour was led by Mr Priddice of Crispins’ PE Department who commented: “I am so proud of every player in the team. It has to be said that we are a school team and not a club and, therefore, to compete at this level is mind blowing. “If we had more opportunity for match practice before we went, mixed with one of our key players Isaac Milford being well, I think we would’ve been up there! The team would like to thank everyone who made the trip possible, especially all the parents for their fundraising efforts and sponsorship from Jual Clothing, Howdens Glastonbury, TS5C, Encore Electrical, CrossFit Sweet Track, Holly Priddice’s Slimming World Group and everyone who attended the fundraising evening at the Victoria Club in Street. Also a special mention goes to Zibi Kopyto for co-organising, translating and coaching to a high level.